Following on from 2015’s Tyranny, Julian Casablancas & The Voidz have now simply became The Voidz with Julian filling ingratiating himself into the project for their second album Virtue due on March 30th. What has seemingly been an outlet for his experimentation, their first album was a raging piece of Industrial Rock and Dark Electronica with elements of everything from Heavy Metal to Hip Hop. It was an explosion of ideas that worked for the most part; made sense by eventually finding itself a hook or rhythmic section. With their latest work, even this seems to be too mundane for them. After the bizarre and slightly terrifying ‘QYURRYUS’ and more introverted songs, we now have their latest in ‘All Wordz Are Made Up’. Still warped in their analogue presentation, this track booms out a whirring, distorted beat with light percussion, Julian’s best Pop impression and off key vocoder parts. Whilst this is the most consumable of the two main singles, you start to get the impression that they’re just throwing all discipline out the window altogether. Groups like The Knife soared way beyond modern musical conceptions, but did so with immense creativity forming a tension and an emotive narrative whilst forging these new sounds. Perhaps Julian and The Voidz are trying that but too hard or aren’t trying at all? It’s hard to work out which right now for as much as I’d like this project to succeed. One of the few defining groups of the 21st Century in The Strokes have released their first material in over three years with their new EP Future Present Past which has been streamed all day and is expected for proper release on June 3rd. When discussing it, Julian Casablancas said the songs could be part of a full album if ‘the collective will can be found’. But for the moment, we have three new tracks and the primary single is ‘Oblivious’. It has shades of their first two albums to it, particularly in Nick Valensi’s slightly distorted lead guitar licks and the rough edged recording of Julian’s vocals. As well as this, it has that crashing chorus and heavy melody to it. It is different in its greater sense of depth between verse and chorus and a general production direction that has the song pulling in one, bigger wave of sound. There’s also flashes of Julian’s work with the Voidz in the instrumental section with heavily modulated vocals and guitars. ‘Drag Queen’ is certainly more evocative of this more gritty, yet encompassing sound with the extended bass lines and rhythm sections. These break out into greater areas of light with the open, thrashing guitars and ringing lead elements. The track has several sections as well as a melodic, anthemic interlude towards the songs conclusion and is demonstrative of the new avenues they may take. ‘Threat of Joy’ is a light, airy track with simple, jangling rhythms which, with added gradual reverb merge with Julian’s washed out vocal before swinging back to its more pepped up sound. Nothing new to learn here though. It’s an EP of different approaches and for the most part these work effectively with signs of familiarity mixed with recent and new approaches. It remains to be seen whether this balance will be altered but it should be an intriguing listen nonetheless. The Strokes guitarist is set to release his third studio album at the end of July to follow on from his 2013 EP AHJ. 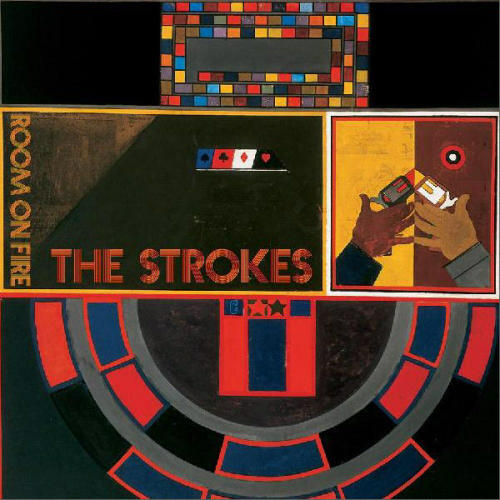 That EP didn’t offer up much of a shift from the traditional Strokes sound, unlike the very different routes taken by lead singer Julian Casablancas with his 2010 and 2014 albums and in some ways this dictated the Stokes direction. His third album will be called Momentary Masters and one single from this is ‘Losing Touch’. It very much remains in that zone of a Strokes-like circa 2001-2003 and there’s little evidence of him moving from his comfort zone, but there is a more fluctuating production from the clear riffs and bass in the verses and a more spread out sound later in the chorus. It’s still a rhythmic, sing-a-long event so it’s still worth a listen especially if you’re harking for some Strokes nostalgia. The band of the lips of everyone after their game changing Is This It? in 2001, which is already a cult classic, was The Stokes. As much as I admire their debut and recognise there wasn’t a monumental shift up in gear with Room On Fire; I personally prefer the album. I think cleaning up the production slightly really worked for them and in general they had honed and refined the sound they produced at the very start of the Millennium. There’s equally some great hits off Room On Fire. ‘Reptillia’ and ’12:51′ being the most popular perhaps. However, for me my favourite track was the first. ‘What Ever Happened’ opens with the spikey and reluctant riff and the cymbals before Julian leads the other elements into a sudden progression of the song with a more tuneful yet at times more gruff vocal from him while the churning chord progression of the rhythm guitars and bass create a simple and effective melody. It then shifts again with the lead guitar fizzling its way through to the next verse after the chorus before Julian effortlessly leads Albert’s rhythm section back to the second phase. The grouping of instruments and the vocals from Julian make the song immediate and leave you vulnerable to its simple hooks and melodies as do the shifts in the songs progression. It’s certainly a song for someone wanting to reminisce about their original sound. Many of the bands that emerged from the subsequent decade can trace their immediate influence to The Strokes and that shouldn’t be forgotten. Julian had left us guessing for a good few months before releasing ‘Human Sadness’ a few weeks ago. Before that, all we had to go off was a video discussion from within a thirty year old car and a short album preview. It almost continued in the vain of The Strokes near media blackout of the promotion of Comedown Machine, but since September Julian has emerged with various videos and appearances that included his and The Voidz showing on Jimmy Fallon last night. 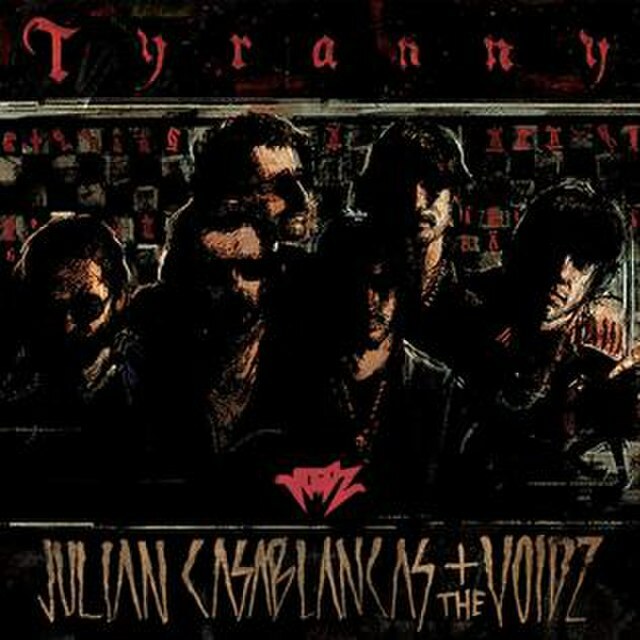 Tyranny is the follow up to Casablancas’ solo debut Phrazes For The Young from 2009; an album that signalled a greater shift in The Strokes sound and the ambitious sound being tried by Julian this year should do just that and a lot more. ‘Human Sadness’ is the most un-Julian track you could imagine at eleven minutes long and opens with strings that are set aside Julian’s more harmonious yet distorted vocal. It is joined by heavy jumps sample driven jolts and high voltage lead guitars that are layered over the steady rotating riff rhythms. The song then begins to take hard base punches as the vocals rise in volume conclude a controlled chaos sort of opening as it filters down into a reverberating and distant sound with Julian’s vocal before launching to immediacy and standing to attention as light hits the elements to show a mix of Julian’s vocals clashing with the wiry and the distorted guitar parts, along with the grinding beats behind it. It goes to lead into another electrified riff of high charge and into a bass driven interlude with Julian’s more traditional ‘early Strokes’ type of vocal and even with a hint of pop melody before yet anther change as the song’s riffs grow darker and heaver before fading off in an electronic ballad-like fashion and to a sweeping conclusion, as if the end of a play or some form of theatrical event. It’s pretty exhaustive listening to the track for the first time, never mind trying to make a cohesive description of it. Experimental has been the word used to save people some time as it’s hard to create a sub genre with enough dashes to make sense. ‘Where No Eagles Fly’ is at a much more sociable length for those with a lack of time on their hands but don’t expect any familiarity. In fact, that is fast becoming the best way to explain what this album might become. It commences with a gritty and deeply rooted bass line, almost krautrock-like before off kilter riff feeding off it and Julian’s lazy vocal meandering through it, before exploding with severe and quick moving urgency with Julian’s screams and bellows along with static and reverberating guitars and continues with a trap drop into a retro synth chord progression as it continues back into it’s manic and heavy chorus and before you know it, this is combined with pop like rapidity and electronica as Julian does his best Slipknot impression through a thick fog of distortion. It’s a manic and unrelenting record and again, it will take some time to sink in as so much was happening. That is a positive, however. It’s not predictable or easy to guess in any way. It’s exactly what we need to have such an established musician pushing the boundaries like this. Heavily distorted tribal drum hits and synth beats open ‘Father Electricity’ alongside the loose reverberating riffs that are joined by heavily fuzzed out riffs and clean lead parts with Julian’s constantly meandering vocals that are filtered out by a thin glaze of distortion and distant recording. The bass line becomes more prominent as the track progresses and just highlights the rumbling and rattling nature of the track which is sparsely smoothed over with light organs and a finely warped, jangling guitar. Something akin to a holiday resort band on a tropical island. ‘Business Dog’ features eerily oscillating organs that are cut open by a fuzzed and low slung riff before the heavy echoed beats come in and the organs begin to nudge their way through the instrumentals which allows for the rhythm section to generate a real rapidity and urgency about the track with Stroke-like leads before it breaks off into a chamber of chiming organs and unrelenting bass lines from which Julian’s vocals stretch out above them as another alteration with clean sounding rhythms as it goes on to yet another distorted frenzy. Tracks such as ‘Xerox’ have a broken and creepy feel about a simple hip hop or dance beat as the synths above it twist and bend in a faded fashion. Julian’s vocals with this, are his most soft and weirdly endearing given the tone of the song. ‘Nintendo Blood’ bursts open with synth and modulated soakings with a deep electronic rumble beneath it. It generates a chime between the various sounds to grind out an inescapable hook around the nonchalant vocals. The song trails off into wiry cascades and riff briefly as it begins to sink to dark depths of distortion and manipulation, but the song resumes it’s mainstay sound again. ‘Take Me In Your Army’ features a low lying dubbed pulsation with a higher toned riff above it with Julian’s’ floating, pop swooning vocals over the top of it as it intermittent squealing riffs come and go. This album is one of the most ambitious and inventive that I’ve ever heard. No two minutes remain stable or familiar and there a buzz and charge throughout the whole album, that has largely been achieved by making the album gritty and murky in it’s presentation and production; whether you’re met by strings, trap drop sounds, wiry electronic guitar solos or sweeping organs. The album is so highly ambitious that not everything works and fits together effectively, but with a few listens things start to make more sense and in real terms it would be wrong if it sounded correct or family as that’s not the nature of experimentalism. An album that doesn’t give you a moment rest or peace as it throws everything at you. Wear a helmet if you want to listen to this album. Last week, we finally got a proper taste of Julian Casablancas’ second studio album with ‘Human Sadness’ and it was eleven minutes of clashing sounds and genres from string sections to grinding electronica and heavy base beats, wrapped around clean and warped distorted guitars. It fuelled a sensory overload. ‘Where’ No Eagles Fly’ is the second track to be unleashed from Tyranny and was premiered on BBC 6 Music’s Breakfast Show yesterday. It’s a much more sociable length for those with a lack of time on their hands but don’t expect any familiarity. In fact, that is fast becoming the best way to explain what this album might become. It commences with a gritty and deeply rooted bass line, almost krautrock-like before off kilter riff feeding off it and Julian’s lazy vocal meandering through it, before exploding with severe and quick moving urgency with Julian’s screams and bellows along with static and reverberating guitars and continues with a trap drop into a retro synth chord progression as it continues back into it’s manic and heavy chorus and before you know it, this is combined with pop like rapidity and electronica as Julian does his best Slipknot impression through a thick fog of distortion. It’s a manic and unrelenting record and again, it will take some time to sink in as so much was happening. That is a positive, however. It’s not predictable or easy to guess in any way. It’s exactly what we need to have such an established musician pushing the boundaries like this. After what has seemed like an eternity, we finally have something solid from Julian Casablancas and The Voidz. We now have an album title in Tyranny and a release date of September 23rd. On top of this, there is now a track listing of twelve songs with titles such as ‘Xerox’, ‘Nintendo Blood’, ‘Crunch Punch’ and ‘Human Sadness’, which is today’s release. It is the most un-Julian track you could imagine at eleven minutes long and opens with strings that are set aside Julian’s more harmonious yet distorted vocal. It is joined by heavy jumps sample driven jolts and high voltage lead guitars that are layered over the steady rotating riff rhythms. The song then begins to take hard base punches as the vocals rise in volume conclude a controlled chaos sort of opening as it filters down into a reverberating and distant sound with Julian’s vocal before launching to immediacy and standing to attention as light hits the elements to show a mix of Julian’s vocals clashing with the wiry and the distorted guitar parts, along with the grinding beats behind it. It goes to lead into another electrified riff of high charge and into a bass driven interlude with Julian’s more traditional ‘early Strokes’ type of vocal and even with a hint of pop melody before yet anther change as the song’s riffs grow darker and heaver before fading off in an electronic ballad-like fashion and to a sweeping conclusion, as if the end of a play or some form of theatrical event. It’s pretty exhaustive listening to the track for the first time, never mind trying to make a cohesive description of it. Experimental has been the word used to save people some time as it’s hard to create a sub genre with enough dashes to make sense. My only advice would be to judge for yourself!